Nigeria Customer Service Awards Limited, organisers of the Customer Experience Management conference invites the general public to the 6th edition of CEC 2018. The 2014 edition was sponsored by Heritage Bank, DHL and Konga 2015, BOI and AFP Furniture 2016 and 2017 was sponsored by DHL. It promises to be engaging, expository on the current customer relationship management software and educative to customer experience enthusiast, the conference is for all the sectors. It will feature workshops/ pieces of training, master class, presentations, exhibitions, and awards. 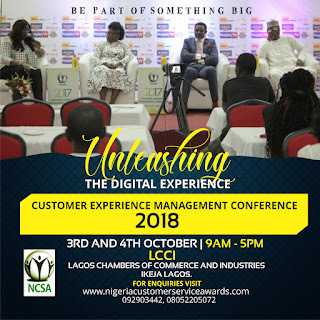 According to Aliyu ilias the 2018 theme for is unleashing the digital experience for customers, which is apt with the fast risen of digit growth in the world that greatly affects businesses, there is a need to look into the use of cutting-edge technology to deliver excellent customer experience and achieve organizational goals. Theme: "UNLEASHING THE DIGITAL EXPERIENCE". Venue: Lagos Chambers of Commerce, 10 NurudeenOlowopopostreet and Industries (LCCI) Ikeja. All the companies that attended the past editions confirm the impact on their process, staff attitude and customer experience advancement for their customer and it reflect in their profit base.